Home politics TDP MPs make fun on fasting- video goes viral ! TDP MPs make fun on fasting- video goes viral ! Every party in AP is raising its voice for Kadapa steel plant. Some leaders went forward to stage dharnas and fasting. But now a video has gone viral in social media where it shows TDP MPs making fun on fasting. It shows MP Murali mohan commenting that he shall go fasting for a week as he wants to reduce his weight. The video shows that the MPs are not at all serious on the steel plant and Vizag railway zone issues. However, the MPs have condemned sating that it was a morphed one. 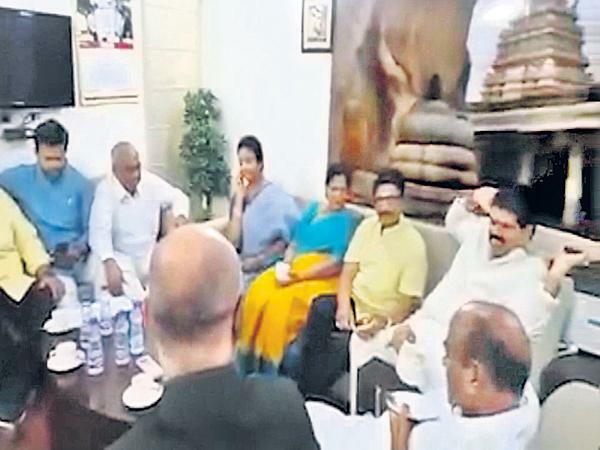 Muralimohan, JC Diwakar Reddy, Avanti Srinivas, Ravindra Kumar, Kesineni Nani, Rammohan Naidu etc. can be seen in the video.